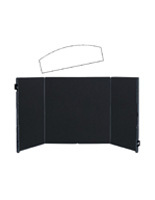 This countertop display board with case have hook and loop fabric on which to pin promotional messages, graphics, and brand-boosting information. 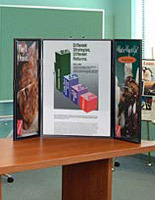 This trade show exhibit stand for desktop measures 50.25"w with a 48" x 24" presentation area. 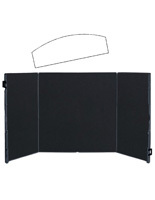 This display board comes with (4) panels that fold right into the carrybag, and everything weighs under 10 lbs. 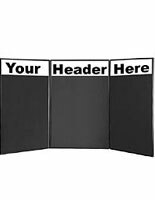 Each of the tabletop showcases is sold with a custom printed header with one- or two-color graphics or text. 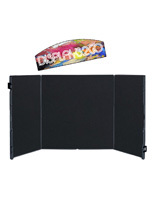 Folding display boards with case are a great way to boost brand by underscoring a logo or brand name at trade shows. 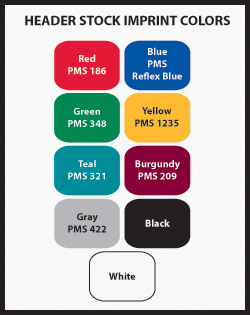 **The header has a white background, Choose standard vinyl colors for the text. Select custom text and color choice in "Special Notes" section.